Well I’m back from Pordenone, with plenty of stories to tell, and all in good time there will be the Bioscope’s Pordenone daily diary for your delectation. But a week is a long time in ther world of silent movies, and much of interest has been happening. So we’ll be having a few quick-fire news items, starting off with what for me is the pick of the bunch. How many concerts have you been to where there was no pre-recorded music played before the show? None? Same here. How many have you been to where 20 minutes of a silent film (Intolerance, from 1916) was played (silently) before the show? None! Welcome to the current Bob Dylan tour. The usual pre-party atmosphere of a big arena filled with concertgoers was deftly subverted by this simple dashing of expectations. Then, at the appointed hour, the house lights dimmed and the band strode onto the stage. Dylan waited 5 seconds, then sauntered out, too. Classy! The USF Sun Dome was less than half full at the time. Dylan then came on stage and played ‘Leopard Skin Pillbox Hat’, though on the first night it was ‘Rainy Day Women #12 & 35’, which perhaps offers a more obvious link to the film’s title (“Well, they’ll stone ya when you’re trying to be so good…”). Which section from Intolerance is being shown is not certain, the fans on the Dylan forums being unclear on this point so far, but presumably it’s the Babylon sequence. Whether Dylan will continue to show this new reverence for silent film remains to be seen – he has long taken to dropping references to films in his song lyrics, but never as far back as the silents, so far as I know. However, he does have a personal connection of sorts to Intolerance. In 1997 he was the recipient of the annual Dorothy and Lillian Gish Prize, which was established by Lillian Gish (who plays The Eternal Mother in the film, of course) in her will to be awarded to “a man or woman who has made an outstanding contribution to the beauty of the world and to mankind’s enjoyment and understanding of life.” There is a biography of Dylan and other details on the Gish site. Welcome back. Excellent title for this post. Do you know which 20 minutes he was showing? There are so many possibilities. The Jefferson Airplane would sometimes show the conclusion of King Kong before their concerts. When Carl Denham said “Oh no, it wasn’t the airplanes. It was beauty killed the beast,” they would start playing. Not certain clues as to which 20 minutes – so far Dylan fans are revealing themselves to be disappointingly cine-illiterate. I realise now I should have added a line to the post about Dylan “endlessly rocking”. According to one fan site the extract is simply the first twenty minutes of Intolerance.When I heard about Dylan’s inclusion of an extract I assumed (wrongly) that it would be the more spectacular Babylon scenes. Debate, of course, now rages over Dylan’s intentions. My own two pennorth is connected to Dylan’s obsession with the American Civil War. Griffith made Birth of a Nation – Dylan wanted Henry Walthal charging the Union lines – His stage manager got the wrong film and nobody noticed! Interesting theory! Given that those who have commented on the film do note the title at least it does seem that they are screening the first 20 minutes of the film, and all that Dylan is probably interested in is the title. That, and wrong-footing us all once again. Dylan playing during the silent clip. “Silent films were never meant to be silent”. News just in from the Dylan front! According to a ‘reliable source’ quoted on the expectingrain website – the inclusion of the clip from Intolerance is the idea of a new lighting designer. Various clips of other films (none so far identified) are being projected behind Dylan and the band during segments of the show.Wow! I never in my life dreamed that I would be able to write about Dylan and silent film in the same paragraph!of course, from the very beginning of his career people remarked on his ‘Chaplinesque’ stage technique, but this is something different. Apparently the Intolerance clip is a 20-min condensation (by whom?). 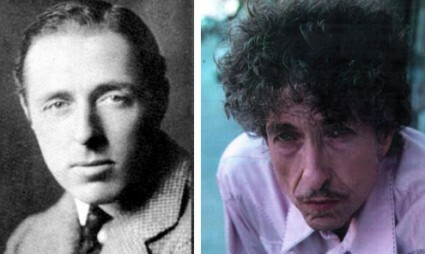 But I agree that the chance to write about Dylan and silent film in one space is really exciting. I just wish there was something in his lyrics that we could wrok on to develop this theme further, but I’ve drawn a blank so far. In the lonely night, in the blinking stardust of a pale blue light You’re coming through to me in black and white when we born in time.